Denis Durantou is making stunning age-worthy wines that, since 1985, have invariably matched or beaten all the top names of Pomerol in blind tastings at Southwold and elsewhere. Produced from 40 year old vines over 4.2 hectares, picked when ripe but never late. No fancy tricks here, just old vines, great terroir and inspired, yet traditional, wine-making. As our blind tastings have proved over and over again, this is one of the top wines of the Pomerol appellation and a genuine rival of neighbours Petrus and Lafleur. 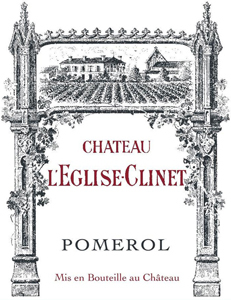 The 2017 L’Eglise-Clinet was picked between 12 and 22 September, the Cabernet Franc coming in on the last day. Nothing was touched by the frost. It is matured in 70% new oak. Denis Durantou did not specify the exact quantity produced, “Just enough for my friends” according to his spec sheet! The bouquet is very succinct, perhaps more open than either the 2015 or 2016 at this early stage, extraordinarily pure with blackberry, wild strawberry, smoke and truffle. It just gets better and better as it opens in the glass. The palate is medium-bodied with fine tannin, linear and focused, very fresh with pointed acidity. This is full of tension and poise, a touch of graphite emerging towards the finish that lingers in the mouth with superb salinité at the end. It completes a triumvirate for Denis Durantou after the 2015 and 2016s. Drink 2024 - 2050. Black core with purple crimson rim. A hint of oak char on the nose but underneath that is pure black fruit and a creamy character. Smooth and rounded on the palate, the fruit and the oak already well melded. The finish is darker and more savoury, the oak char closing the circle. But the harmony is very good. Not as charming as La Petite Église but longer-term in potential. The 2017 Eglise Clinet is a blend of 90% Merlot and 10% Cabernet Franc. The Merlot was picked from the 12th to the 22nd of September. The Cabernet Franc on the 22nd. Production is around 1000 cases with elevage in 70% new oak. A dense and brooding nose of cassis, black cherry and heady liquorice and all spice. The palate is layered with mouthcoating tannins that are ripe but plentiful, offering long-term ageing potential. Beneath this structure there are waves of brambly black fruits, nutmeg, clove, and vanilla with a little sweet smokiness. This muscular wine has great intensity and legnth, without losing the freshness of the vintage. A very long finish denotes the potential here for this serious Vin de Garde. For me, this is one of the successes of the vintage in Pomerol, although not fully escaping the roadblocks of 2017. There is a real sense of precision and elegance here, with floral, violet aromatics and a note of liquorice, and it deals its power in a measured way, one hand at a time - it's a wine to sit with and enjoy. There was no frost at this estate. The Merlot was picked between 12-22 September, and the Cabernet Franc on 22 September. The 70% new oak is a touch present on the close of play, but those tannins are pliable and enjoyable, promising to cradle the fruit for the long haul. Denis made 20% less wine in 2017 overall, but this was because of the drought rather than the frost, which did not affect his vines. He is determined to keep his alcohol levels down, shunning the high peaks in past vintages. He wants to make wines that ‘he can drink’. The attention now on acidity and purity. This vintage has a lower pH than 2015 but higher than 2016. L’Eglise Clinet has more tannins than in 2015, but it is much silkier. He now makes ‘Le vin de mon vignes’. This is a delicious wine with elements of previous vintages, like chocolate and bright, black cherry fruit, but the new identity of freshness and tone is electric.